Come visit America’s Most Interesting City. New Orleans is a sultry town tucked deep in the heart of the Mississippi River Crescent. Although it has changed over the years, its distinctive southern charm remains. Lose yourself in the cradle of American jazz and explore the best hotels in New Orleans. Arguably America’s most multicultural city, New Orleans runs deep with its European and Caribbean roots. You’ll soon find it wears its French, Spanish, Haitian and Cuban influences on its sleeve. Dive into a rich culture. When you're here in the big easy, you want nothing but the best. 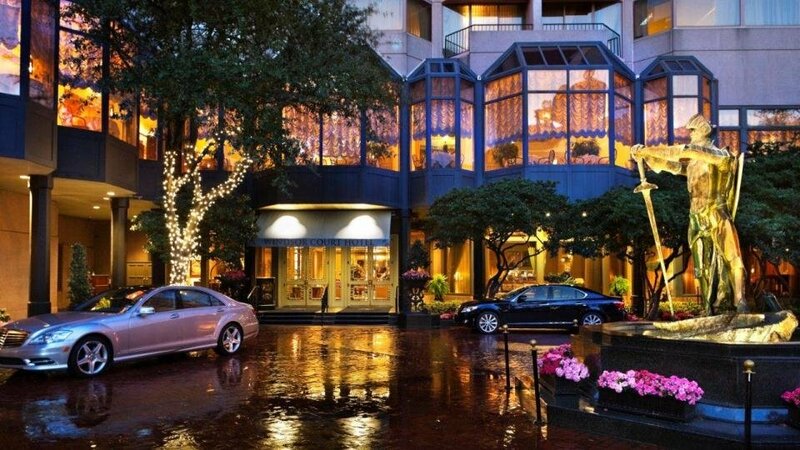 Here are some of our favorite hotels in New Orleans. If we haven’t convinced you already, the city will. New Orleans and its people have a sense of pride displayed in a grand parade of tradition. Grand Creole cuisines serve up mouth-watering dishes served in centuries-old dining rooms and wild, happy parades stop the street’s traffic. New Orleans has experienced a lot of tragedy throughout its history but it still has so much life to give. You can’t think about New Orleans without Mardis Gras. Falling between February 3rd and March 9th, it’s one of the largest cultural celebrations in the country and famous worldwide. At the beginning of Lent, the city hosts a massive carnival. Everywhere you turn the streets are teeming with dancing, music, costumes, and beads. 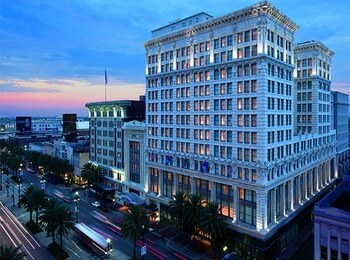 What's more lovely than a stay at a French Quarter hotel? If your visit doesn’t line up with the Mardi Gras celebration, there’s still plenty of fun to be had. We guarantee you’ll love the French Quarter (also known as Vieux Carre). A captivating district near the heart of downtown, it is home to some of the city’s relished colonial buildings, fantastic restaurants, and special souvenir shops. 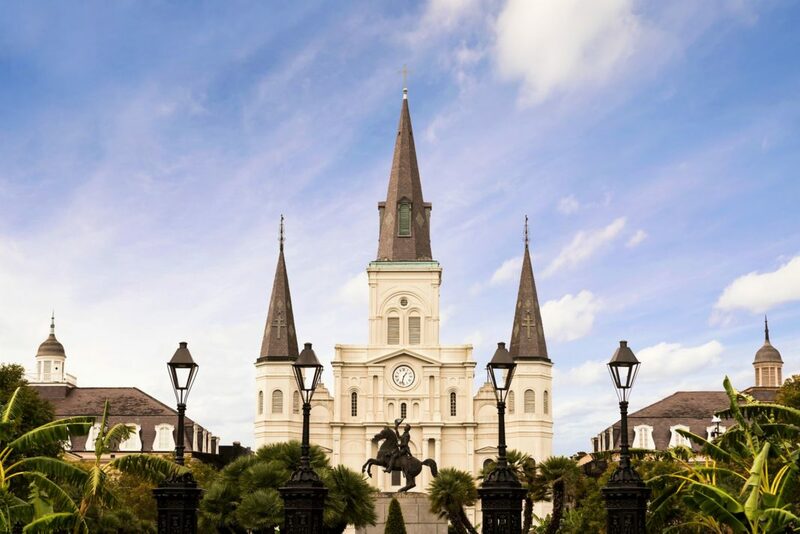 Your visit to New Orleans wouldn’t be complete without a walk through the French Market, touring the St. Louis Cathedral, and having some world-class beignets at the famous Cafe Du Monde. There’s a reason foodies travel from around the world to visit this city. New Orleans is home to some of the best French-infusion and Creole food you could ever dream to eat. For a classic lunch, try a Po Boy, the famous Louisiana sub-sandwich. They usually come with meat or deep-fried seafood. If you’re looking for something a little more gourmet, we recommend Jacques Imo’s in the Garden District. Other local favorites include La Crepe Nanou Bistro, K-Paul’s Louisiana Kitchen, and Commander’s Palace. Before you book your stay, ask yourself what you're looking for in terms of accommodations. What do you want from your stay? Are you looking for cheap hotels, one close to the central business district, or one with an outdoor pool? Perhaps you're having a work getaway. There are plenty of hotels that host a gorgeous banquet space, meeting space, have free wi-fi, and are within walking distance to some of the city's best sights. Whatever you're looking for, book rooms far in advance. The good hotels in New Orleans tend to fill up very quickly. From there, prices soar up, especially in peak season. Popular places to stay include the French Quarter, Frenchman Street, St. Charles Avenue, Royal Street, Faubourg Marginy, Canal Street, and basically anywhere in the historic section. 1. How Far is the Hotel From Attractions You Want to Visit? Location, location, location. We can’t emphasize it enough. It is so important to look at an online map when you book your New Orleans hotel. By making sure it’s close to the attractions you want to see, you can save yourself a lot of time, energy, and unnecessary car or bus trips. While it may be tempting to choose a cheaper hotel off the beaten path, more often than not, you’ll wish you’d booked one in the heart of the city. Make sure they have complimentary wi-fi too; it's crucial to figure out your day plans without chewing up too much of your phone's data plan. 2. When Do You Want to Travel to New Orleans? The best hotels in New Orleans can get booked up very fast. For comfortable, cool weather, consider booking your visit sometime between February and May (when Mardi Gras is in full swing). If you don’t care about the partying scene, book your trip between December and January before the big tourist rush. You’ll have more hotels to choose from if you do. Want more help on deciding when to visit? Check out this in-depth guide that goes over the best times to visit New Orleans. 3. What Type of Experience Are You Seeking In New Orleans? Are you looking for luxury, local culture, or a little bit of both? Do you want a rooftop pool, whirlpool tub, and walk-in shower? Depending on what you want, the city has plenty to offer in the way of hotels. The closer you get to the city center, the more you’ll get to experience the flair of local culture. On the other hand, larger hotels and hotel chains offer a more quiet and romantic stay away from the crowds. The choice is entirely up to you. Although you can't really go wrong with any of the best hotels in New Orleans, it helps to take a look through what they can offer you. 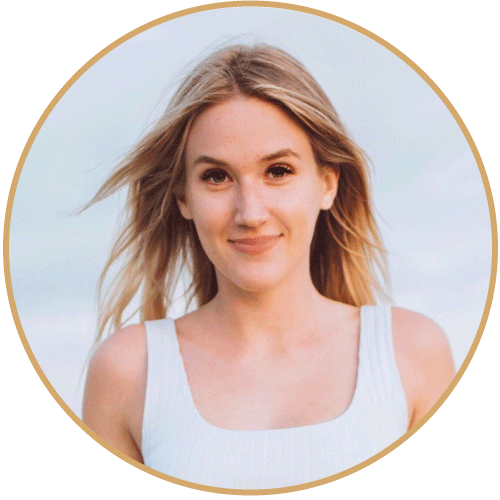 Whether you’re traveling with the whole family, bringing friends, or just going on a romantic trip for two, make sure to check out the hotel’s accommodations. Room size can make all the difference. If you want a hotel with a view, that’s something to take into consideration too. You really can’t beat the New Orleans skyline at night. Do you have your heart set on a relaxing spa treatment? Perhaps you’re looking for an all-inclusive hotel. Before booking, make sure to check out what the hotels in the area offer in terms of amenities. 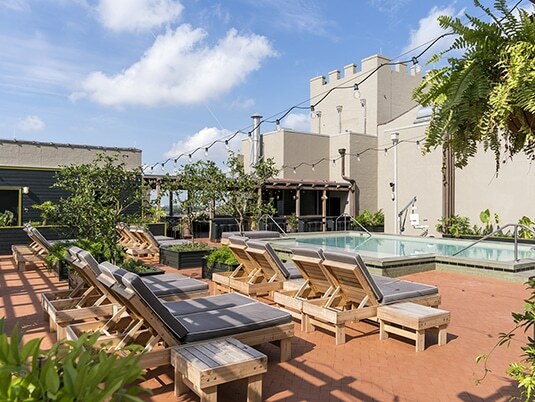 There are plenty of New Orleans hotels with amazing restaurants and beautiful, refreshing pools waiting when you’re ready to cool off and take a dip. What activities are nearby? We’ve mentioned it already but location is key. Ask the hotel what they offer for activities and recommendations specific to your needs. Most places will have guides and pamphlets you can pick up in the lobby to explore your options for the day. 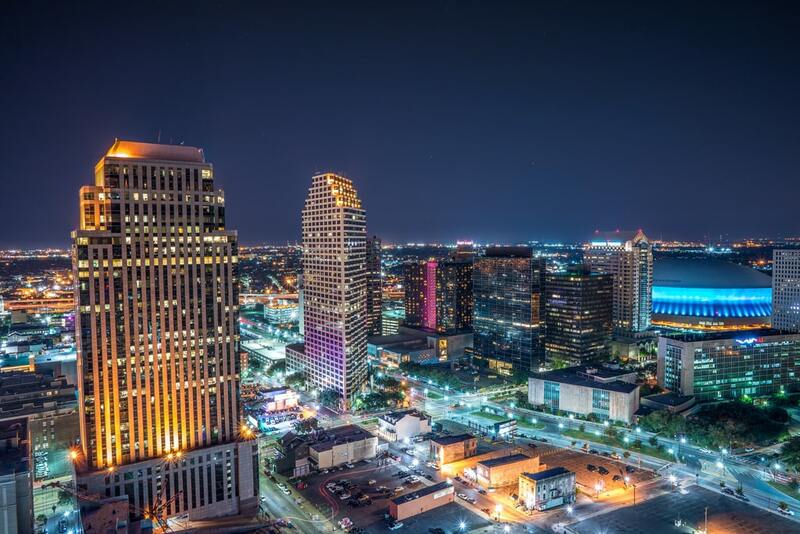 From walking Jackson Square to visiting the Aquarium of the Americas, to taking in a local show, and touring the National WWII Museum, adventures abound in the Birthplace of Jazz. We researched the best hotels in New Orleans to help make your decision easier. From culture, fine dining, activities, and more, these hotels have it all. The Ace Hotel sits on the corner of two happening streets in New Orleans, Carondelet and Lafayette. The Warehouse District is one of the most trendy places to be. You’ll be close to blooming art galleries, historical museums, and just a twelve-minute walk from the French Quarter. Some of the best sporting events and lively neighborhoods are just a stone’s throw away. The standard guest rooms are termed Medium, offering a king-size bed for two, cork-tile-flooring, and window seating. There is a small, functional bathroom equipped with a full set of toiletries. Overall, the ambiance is minimalistic. Should you want a larger room, you can also choose from the following: A Large room, Double Room (with two double beds), a Suite (a larger room with a king-size bed), Corner Room, or the Ace Suite (equipped with a king-size bed and a two-level living room area). The hotel’s restaurant, Josephine Estelle has a distinctly French ambiance. For breakfast, order a delicious brisket scramble or indulge in the all-day diner for lunch or dinner. There are many reasons why the Windsor Court hotel is loved by New Orleans guests and locals alike. From higher-up balconies and windows, you can enjoy a clear view of the Mississippi River. The staff are incredible, going above and beyond to make your stay enjoyable. The hotel’s Grill Room offers some of the most delicious Southern food you could eat. After you dine, head over to the Polo Club Lounge, where contemporary jazz performances are put on five times a week. Rooms are equipped with a delightful mix of English and French decor, Italian marble bathrooms, and mini-bars. You’ll also find a relaxing full-service spa, fitness center, and gorgeous rooftop pool. After you get your fix of rest and relaxation, go out and explore. Since Windsor Court is located on Gravity Street, some of the city’s top sites are just within a short walk. When you think about the best hotels in New Orleans, you probably think about the Ritz. Come immerse yourself in history and culture at this lovely hotel located on the edge of the French Quarter. Set within the 1908 Beaux Arts Maison building, you’ll feel like you’ve taken a step back in time as you enter the mansion’s doors. Guests have the advantage of a close proximity to the city’s most popular attractions on Bourbon Street. The hotel itself also offers traditions to be experienced from right within its courtyard. Special events include the Crawfish concierge, Snowball Sommelier, and Oyster Butler. Choose among luxury guest rooms and suites, ranging from 350 square feet to a spanning 2,800 square feet. Each room is equipped with modern amenities and decorated with an elegant, classic decor. For live music, head to the Davenport Lounge. For dinner, ask the staff for local recommendations or enjoy a quiet meal at the hotel’s M Bistro. End your day with a relaxing treatment at the Ritz’s Destination Spa, the largest spa in the city. Welcome to New Orleans’ signature boutique hotel. Here, art and history come together in the heart of the historic downtown. 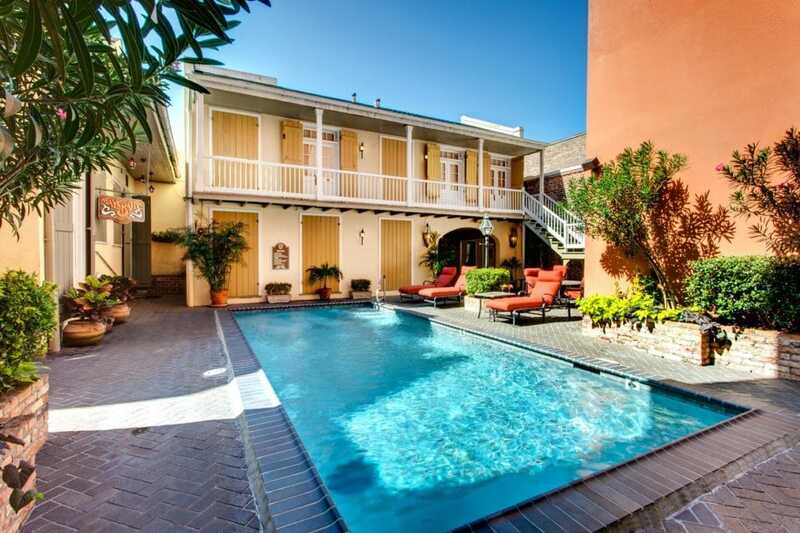 Located just three blocks from the French Quarter, you will enjoy a quiet piece of paradise in the midst of a city bursting with energy. Home to a rotating art gallery, the hotel offers up a little gift of its own to guests seeking a unique cultural experience. In addition to its artistic atmosphere, the hotel also offers Provenance Signature Amenities and Compere Lapin - one of the finest restaurants in the city. Looking for a place to lay your head? The Old No. 77 Hotel and Chandlery offers five different types of rooms. Choose from a studio room equipped for the single traveler up to an Artist's Loft Suite fit for a king. 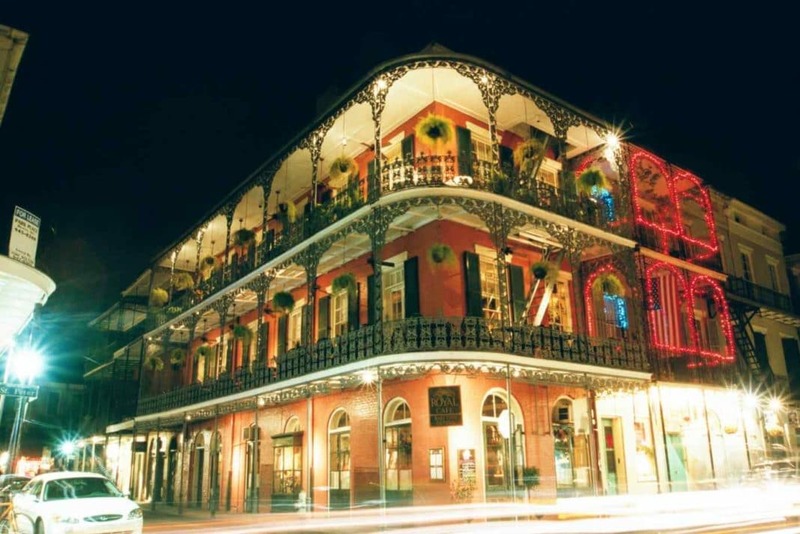 Absorb the heart and soul of the city from one of the finest Bourbon Street hotels. Jazzed up and newly-renovated, the Royal Sonesta has truly earned its spot as one of the best hotels in New Orleans. 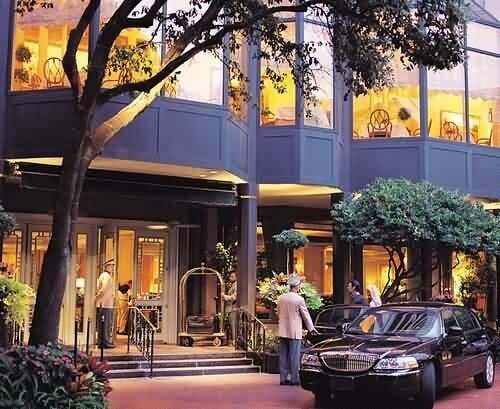 As an AAA Four Diamond-rated hotel, it offers a timeless elegance and southern charm. Rich colors pervade the hotel’s palette, complementing fine linens and fresh flowers. Step out onto your iron-wrought balcony and soak in the views of a lush courtyard. Home to several dining and entertainment options, you can take in all the local flavors at Restaurant R’evolution and Desire Oyster Bar. For coffee connoisseurs, PJ’s Cafe offers a special treat. Make sure to hit up the Jazz Playhouse during your stay, voted best for hotels on Bourbon Street. Last but not least peruse the hotel’s room options. From modest and charming guest rooms to the luxurious Senator suites and Club Levels, the Royal Sonesta New Orleans offers something for everyone. 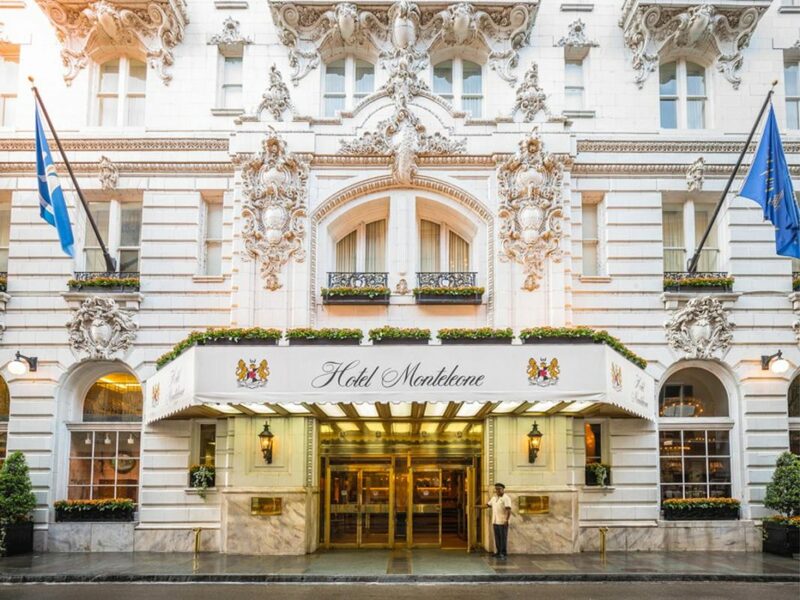 It has been said that the French Quarter begins with Hotel Monteleone. There's a reason why it made it on our list as one of the best hotels in New Orleans. This majestic property sits on Royal Street, offering a convenient proximity to Bourbon Street and the New Orleans Convention Center. Right outside its doors, you'll find shop after shop of gorgeous European antiques, estate jewelry, and plush oriental rugs. Quaint New Orleans eateries and specialty shops line the streets. Here, there is no shortage of luxury and guests will want for nothing. Come and indulge in an incredible experience in the French Quarter at one of the best hotels in New Orleans. 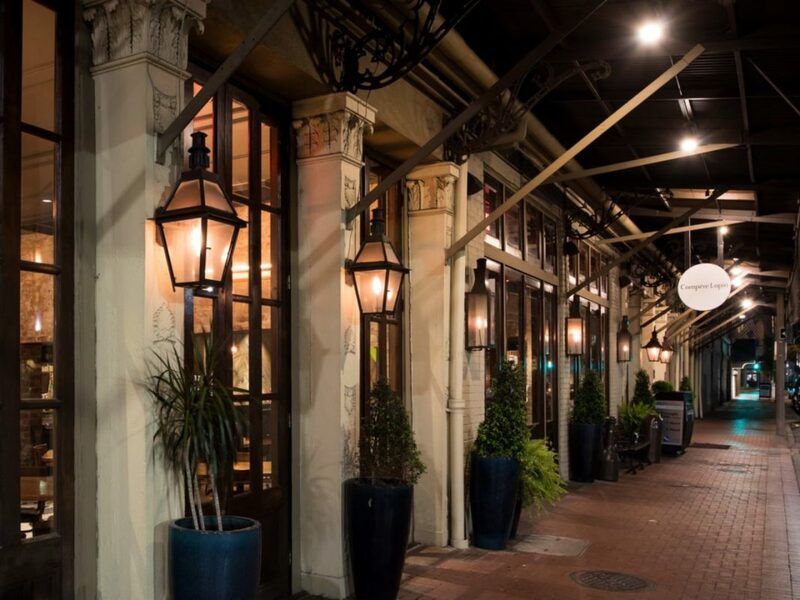 Dauphine New Orleans welcomes guests with open arms into a unique setting. This historic hotel features buildings dating back to the early 1800s, such as the Audubon breakfast room. Guests can take advantage of a quiet, relaxing stay in the midst of a lively, energetic city. When you're ready to get in on the action, your hotel is just a few steps away from some of the most exciting parts of city life. With a flair for life and a rich cultural heritage, New Orleans and its people have it all. Choose from one of the best hotels in New Orleans and enjoy a stay custom to your unique travel needs. Have you ever been to New Orleans? Let us know about your favorite places to dine and stay in the comment section below.